This is a simple way to take a set of printed plans and craft a quick three dimensional model. 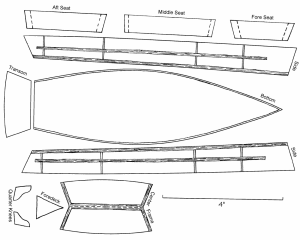 It won’t be an accurate representation of the actual boat but it will give you a better feeling of scale and mass plus it demonstrates how the shape of a plank laid out flat influences the shape of the boat when bent around a form. Later in this series we’ll build one that is more accurate to the true shape of the boat.